I’ll start off with a nice happy picture, just to show that some of today’s run was quite pleasant. 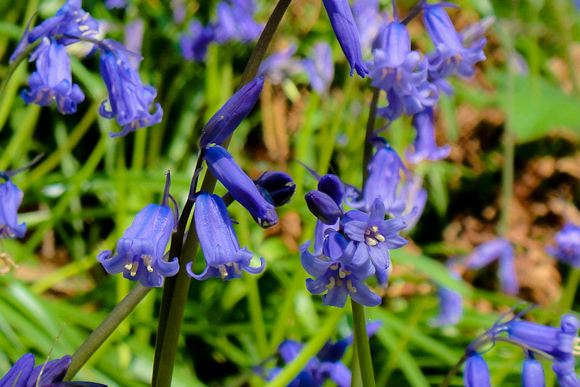 These are a few of the millions of bluebells currently carpeting Leigh Woods, which makes the woods even nicer than usual for jogging. And it was also a nice sunny day, as you can probably tell. But those are about the only good things. And now I’m grumpy. I started off running feeling okay‐ish. It’d been a while, because of my recent bout of flu, but I mostly seem to be over that; even the residual cough is far less enthusiastic now. But I wasn’t feeling 100%. I wasn’t helped by RunKeeper (or, perhaps more charitably to RunKeeper, maybe the GPS on my iPhone) having one of its occasional “funny five minutes”. I realised something was going a bit odd when I got the “you’ve run four kilometres” voice prompt really very soon after the 3km voice prompt. Then, thirty seconds or so later, RunKeeper told me I’d got to 5km, and that I was averaging 4 minutes per kilometre. That’s about 15kph, or, to put it another way, significantly faster than I’ve ever run. So, my RunKeeper log of today’s run is pretty screwed. Worse was to come. At somewhere around the real 5km mark, I realised my shiny new Mizuno Wave Inspire 7s were giving me a blister. One bit of the right shoe, in the instep, seemed to be rubbing a bit. I carried on for another half a kilometre or so, then had to start walking. No sense in making things worse, I figured. So, basically I gave up and limped back across the bridge to Clifton Village, and now I’ve got to see if I can send these shoes back. Annoyingly, this is the first pair of running shoes I bought from the internet, rather than in lovely local shop Moti. D’oh. So, that’s my joy of running today. Better get out there again soon, and probably in my old, reliable — if slightly worn down — shoes. I don’t want to have running associated too much in my mind with pain and grumpiness. Bah.